I have a really fun card to share with you today. 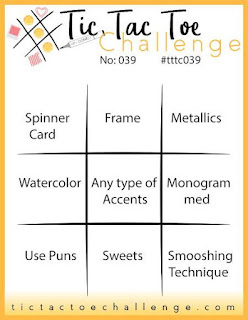 This week's challenge board had "spinner" as one of the elements. given my love of interactive cards it was an easy choice. I went with the left diagonal down on the board: Spinner Card - Accents - Smooshing. 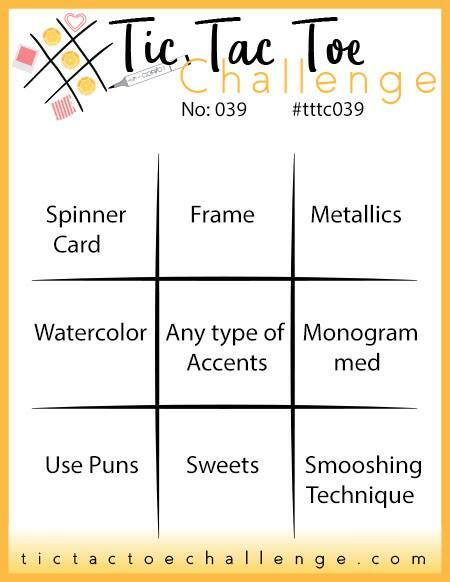 Please be sure to visit the challenge board to play along with us! Spinner cards are one of the easiest interactive cards (in my opinion) because all they require a thread to be secured at both ends, a die cut element plus the space to spin. I decided to make 3 spinners for this card just to make it more interesting. Just one spinner is certainly the best place to start if trying for the first time. When fully closed you can see the subtle patterned background showing through the circle windows. 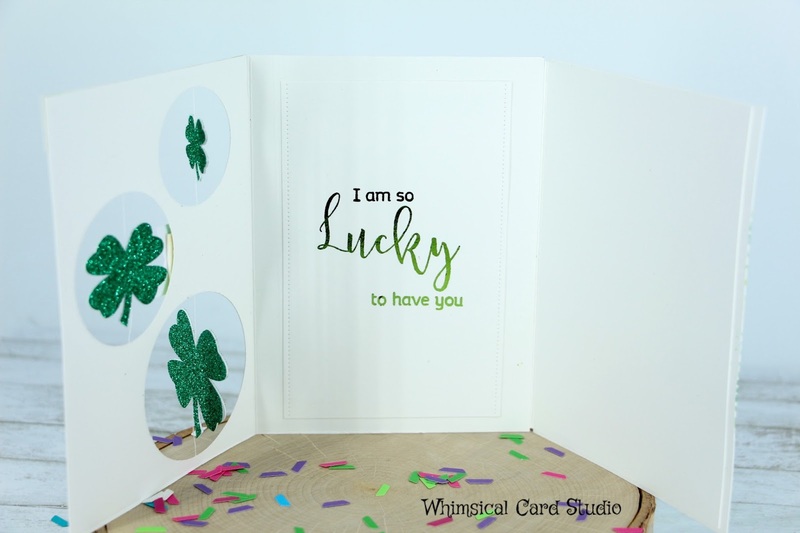 The shamrock die cuts were done with my Cricut on glitter paper. I can't share the file I used because of restrictions - uploaded images by a user are not shareable. 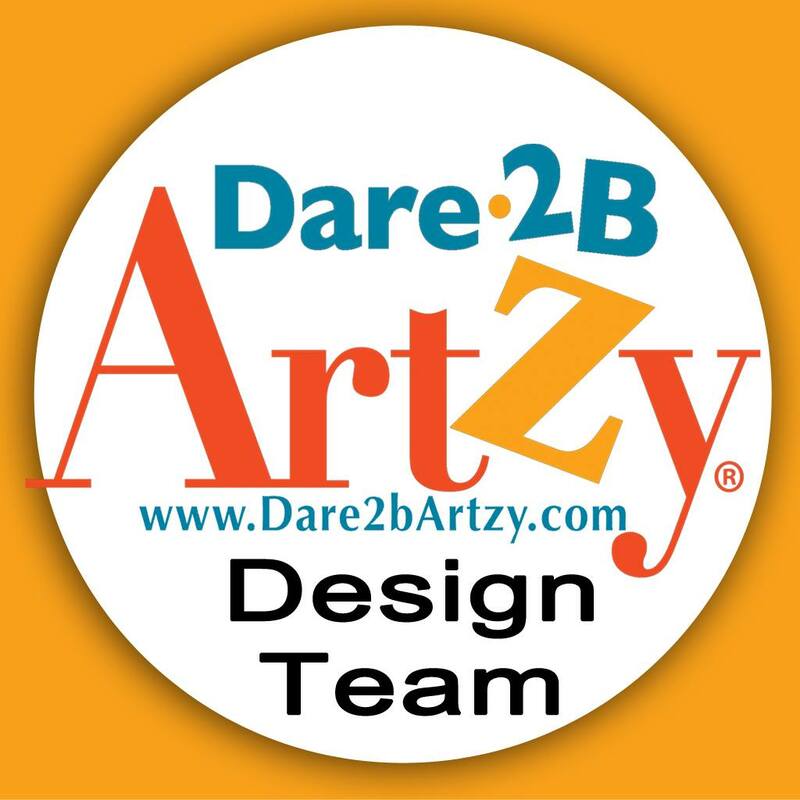 It is easy to locate shamrock images and upload for use to Design Space. 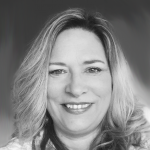 Lorrie Nunemaker is fantastic at Cricut tutorial videos - here's her YouTube video on how to upload images to Design Space. I sized the shamrocks so the height for each was 2", 1 1/2" and 1" respectively. The two die cuts have to be mirror images in order to line up correctly. Some shapes will look the same no matter whether you are viewing from either side but this one has the stem that leans to one side. I smoothed three Distress oxide inks on the front of a white cardstock panel measuring 4 1/4" x 5 3/4"- using Lime, Cracked Pistachio and Mowed Grass. I wanted the panel slightly smaller than the overall card base. I used a temporary adhesive to place the colored panel onto a white card base (I used 4.5" x 6" folded) so I could run it through the Big Shot unfolded with the colored panel. Before running it through I placed 3 circle stitched dies in the places I wanted them so the cuts on both the colored panel and base would be in the correct spot. The card base was unfolded so only the front panel got cut. After cutting this I saved the colored die cuts as additional embellishment. I used the circular lace stencil from Simon Says Stamp to create a subtle background. First I pressed Distress Oxide Cracked Pistachio ink onto the stencil itself. I then placed the stencil on top of a white cardstock panel and ran it through the Big Shot machine using an embossing pad. I adjusted the sandwich to have less pressure so that the stencil did not emboss the paper. My goal was to ensure the ink came into even contact with the paper and add the most color possible. I left the stencil in place, and pounced on Distress Oxide ink in Mowed Grass to partially fill in the space normally used to add color over the stencil. I used another card base and trimmed off the right side (leaving the left side intact) by about 1/8". I glued the left panel underneath the middle so the right side could fold in over the middle. I glued on the middle panel with the right side folded over the middle so when the top panel is closed the background is seen through the die cuts. Used stamps to create a custom sentiment. Using Concord & 9th's Sophisticated Script set (upper and lower case sets), I stamped the work Lucky on white scrap paper. 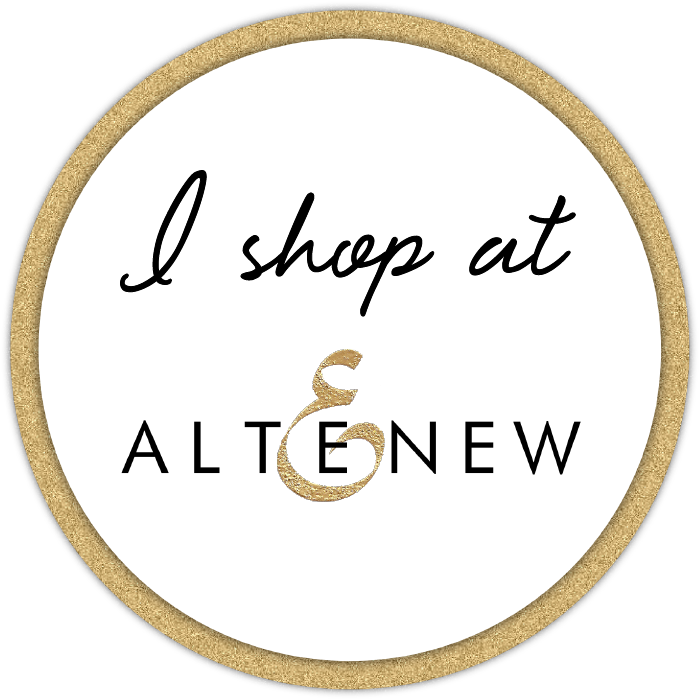 I then stamped the other two words from an Altenew stamp set above and below. I did this with Simon Says intense black ink to make sure I had a crisp, dark impression. I like this ink because it dries quickly and leaves a crisp impression. I copied the stamped sentiment (photocopy with laser printer) onto 80# cardstock. 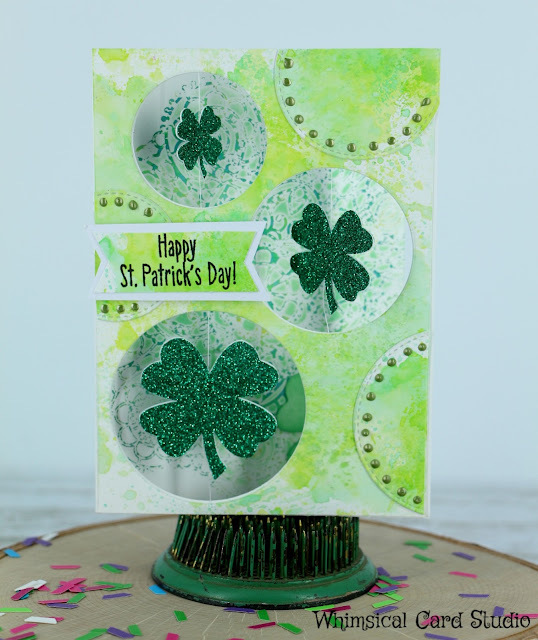 I then used Gina K's heat reactive foil in Grass Green by running through the laminator (Minc in my case). I die cut around the panel with the largest rectangle die I have and glued down the panel on the inside to complete the card. That's a lot to write for one card. 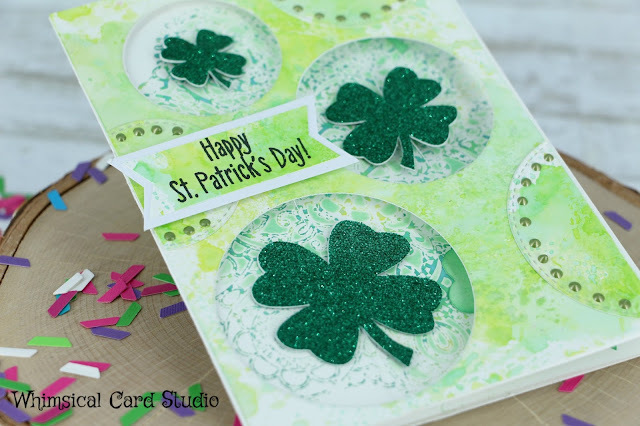 I am hoping to find the time to make a video on the entire process for this design and when I do I will be using all stamped images in place of the shamrocks. If you have not already, please be sure to subscribe to my YouTube channel so you will know when the video comes out! The pleasure is ours Linda! I need to go take a look at your card right now! Thanks for the lovely comment!